I first met Giuseppe Lonardi a number of years ago when he worked with James Koch of JK Imports (their current US importer is Small Vineyards LLC), and James and I went to the Trattoria da Bepi, his family's restaurant in Marano di Valpolicella (highly recommended, BTW). The wines impressed me then and I made a point of tasting them at the Amarone Anteprima thereafter. For the past couple of years he hasn't presented his Amarone at the Anteprima, because he tends to bottle a little later into the year and would rather not present just a barrel sample. So this year I went to see him. The winery is under his house, neatly arranged tanks and botti, and a small bariccaia in the adjacent building, and when I arrived he was in the process of draining the Ripasso, a Valpolicella Superiore that gains greater depth and complexity by spending a time over the marks from the Amarone. 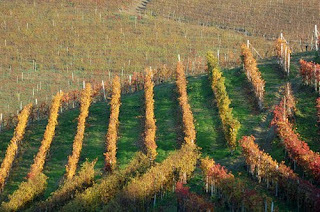 He has 7 hectares of vineyards, some of which are more than 50 years old, and the remainder 10-15. They are trained to the classic Pergola system, which Giuseppe likes because it keeps the grapes from becoming heatstruck if the temperatures spike, all planted on calcareous extremely stony soils in the terraced hillsides around Marano di Valpolicella (the heart of the Valpolicella Classico area). Giuseppe makes the wines, while his daughter Silvia, who joined him after completing her studies, handles exports and PR, and has also set up the Locanda Corte Lonardi, a B&B above the restaurant. Pale cherry ruby with brilliant reflections and white nail. The bouquet is bright, with brambly wild cherry supported by some greenish vegetal accents and pleasant spice from grape, sandalwood with some savory accents and graphite shavings. Quite pleasant in a lively zesty key. On the palate it's medium bodied, with bright sour cherry fruit supported by greenish sandalwood laced acidity and tannins that have a dusky greenish sandalwood burr, and flow into a clean fresh fairly sweet sour cherry finish. Quite pleasant, a lark of a wine that will go very quickly, and that you will want a second bottle of. Perfect with grilled meats and similar, and also with fried meats and vegetables. Deep cherry ruby with black reflections and cherry rim. The bouquet is fairly rich, with cherry fruit supported bouquet savory spice and some sandalwood, and by pleasant greenish accents with some pleasant underbrush as well, mingled with sea salt. It's still coming together -- recently bottled -- but promises quite nicely. On the palate it's rich, with powerful cherry fruit supported by deft berry fruit acidity and tannins that have a dusky sandalwood burr; it's quite full, and quite fresh, and very much fruit driven, without an excess of alcohol -- it's 13% alcohol -- and will work very well with roasts or grilled meats, including slightly drier cuts. There's a cheeky, with a curvy, but not vulgar allure to it; the Italian word would be accattivante, the sort of wine you can find yourself wanting to finish off. This is a 50-50 blend of Cabernet Franc and Corvina. Deep black cherry ruby with black reflections and some brick in the rim. The bouquet is fairly intense, with cherry fruit laced with graphite shaving and some brooding vegetal accents, and also some candied berry fruit notes derived from the partial drying of the Corvina. Powerful, and again young. On the palate it's full, with powerful cherry fruit supported by greenish vegetal accents and some leaf tobacco from the Cabernet, and by smoky acidity and tannins that are ample and still smoothing., flowing into a clean dusky cherry fruit finish with a vegetal laced dusty burr. Pleasant and powerful, in a more international key than the indigenous wines, and will work very well with roasts or stews; it's quite approachable, and you will greatly enjoy it if you like the style, which is measured, with good but not excessive acidity and good concentration. Deep black cherry ruby black reflections and cherry rim. The bouquet is classic, with rich sweetness mingled with prune and plum fruit that has some date accents and hints of sandalwood and greenish bramble supported by some alcohol, it's quite harmonious and gives an impression of great velvety smoothness. On the palate it's full, sweet, and rich, with powerful cherry plum fruit supported by berry fruit jam and dusky tannins that have a slightly bitter sandalwood burr, and flow into a fairly long clean prune finish. Quite pleasant, in a rich and rather voluptuous key, a wine that will work nicely by itself or with green cheeses and similar. Bottom line: A fine winery, and a beautiful place to eat and stay. The only downside is that you may not want to leave. This time Luciano takes the stand. 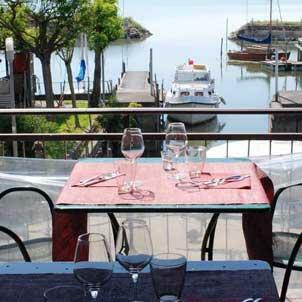 The Taurasi area doesn't have much in the way of gastronomic options, though something is finally starting to happen. 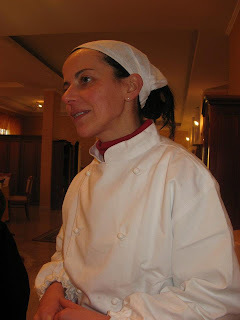 You have to go to Nusco, to Antonio Pisaniello's Locanda di Bu, the Pignata in Ariano irpino, or the Fischetti Brothers' Oasis in Vallesaccarda Ten minutes from here you will find this restaurant, run by Lina Martone, who handles the kitchen, and her husband Giovanni in the hall: a surprise in the heart of the Appellation that will leave you happy and satisfied, because the hand at the burners is authentic, culturally sound but not overly cerebral, and innovative without excessive virtuosity, and for the GM Free and organic Pasdaran, a club we of course belong to, almost everything served at table is made there, from the flour used to bake the bread, to the oil, to the fruit, and to the vegetables. Her father opened the restaurant in the 80s, and to get an idea of how much things have changed one need only glance at the name, Megaron, aimed primarily at receptions, and is now perfectly in keeping with the size of modern outfits born for banqueting. 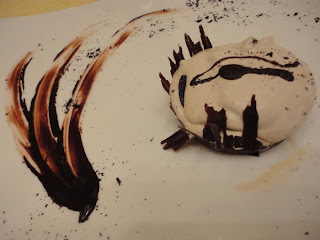 In 2000 Lina Martone reopened it with her husband Giovanni: about 40 seats, a nice hall in which to enjoy an aperitif or a coffee, a good wine list, and great attention to detail. One generally starts off with a beignet (chestnut or pomegranate glazed with nettles) and its interplay of hot and cold. 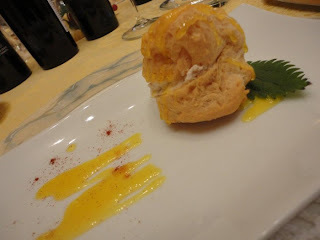 Expressions of Irpinian garden cuisine, classic self-consuming agriculture. 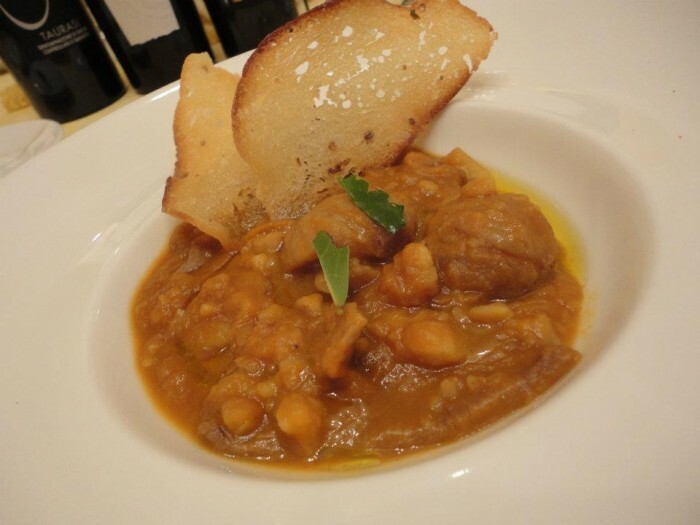 To follow a good Irpinian zuppa, and fried baccalà with creamed chickpeas. In the past we have also sampled the Neapolitan-influenced bell pepper crostata on a bed of sun-dried tomato cream, and an excellent Savoy Cabbage cream. 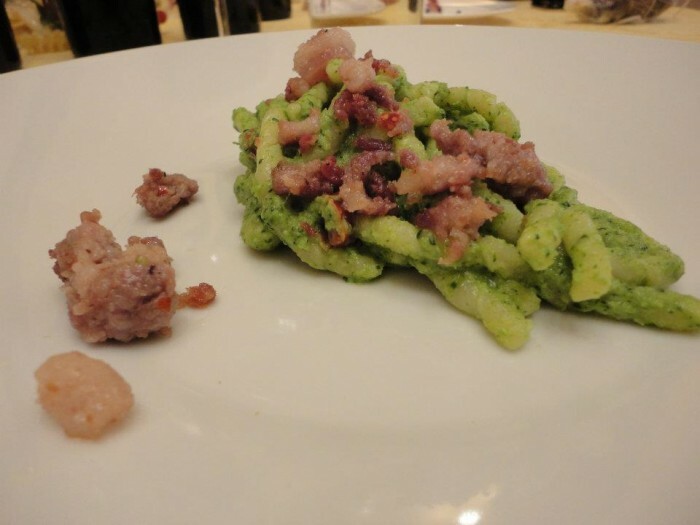 Among the first courses, the home-made fusilli with broccoli from Paternopoli and home-made cotechino. Libidenous. Finally, a small selection od cheeses followed by a great variety of desserts. Home-made Crostata, chiacchere, and millefoglie swith cream stuffing are but there of the possible choices. The wine list varies with the seasons. Expect to spend about 35 Euros to dine. 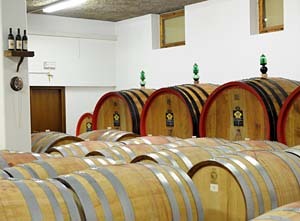 Tentua Giustini was founded in 2005 by Maria Grazia Longo, whose family had made wine for generations but had always sold it in bulk. They have 15 hectares of vineyards, some quite old, planted to indigenous varietals; the vines that yield Primitivo Dolce are trimmed in the Alberello style and the rest to the double cordon spur system. This is their mainstay; it's deep black cherry ruby with black reflections, and has an elegant nose with berry fruit and floral accents, mingled with menthol and graphite shavings. Cheeky, like a smiling child. On the palate it's medium bodied and rich, with pleasant berry fruit supported by moderate acidity and tannins that are smooth and balsamic, with some sandalwood warmth, and flow into a long warm slightly balsamic finish. Very approachable, with a touch more acidity and tannin than some would want in a wine to drink by the glass, though not me. It will work very well with drier meats. Deep brick ruby. The bouquet has cherry fruit with savory spice, some plum, and considerable freshness with hints of menthol and a fair amount of alcohol that confers sweetness. On the palate it's full and graceful, with plum prune fruit supported by some balsamic notes and smooth sweet tannins that flow into a long warm rather balsamic prune finish. Pleasant and well defined; it will drink very well with drier meats. Deep brick ruby with cherry rim. The bouquet is spicy and moderately sweet, with some graphite shavings and spice -- not as sweet as I would expect a Primitivo Dolce to be. On the palate the sweetness is there, however, somewhat diarticulated from the prune fruit, which is supported by balsamic tannins that flow off into a balsamic prune laced finish. It's going in two different directions, with a finish quicker than I might have liked, and though one can say it needs time to come together, it will never display the baroque opulence I associate with Primitivo Dolce. Up until last year the entrance to Rosso di Sera, in San Feliciano, was "presided over" by a Cook/Puppet much better suited to a restaurant run by Freddy Krueger than the peaceful, welcoming people who actually owned the place. Thanks be to god that that disquieting statue, the only off note in a place where you can settle in comfortably and trust the kitchen, service, and wine list has come to the same end Dear Freddy did. 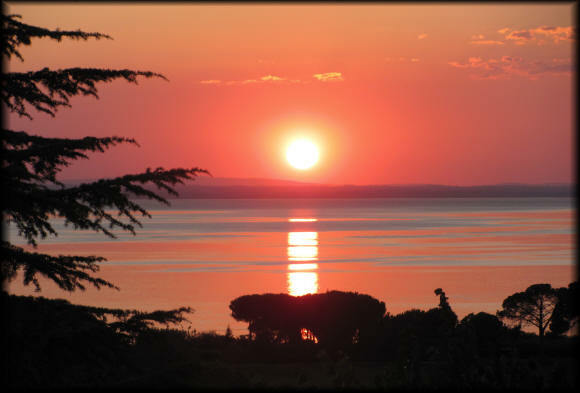 We're on the shores of Lake Trasimeno, directly overlooking the fishing port of San Feliciano, just a short distance from Passignano sul Trasimeno. Why Rosso di Sera? Not just because the hall offers beautiful views of the sun setting over the lake, and not just because the place is open only evenings (except Sunday), not just because the small internal hall used in winter is painted red and the lights of the ample summer terrace are all red, and soft enough for evenings that... come to the proper conclusion. Indeed, all this red is there for practical reasons too; if the lights were white the place would attract millions of bugs, the same bugs that you'll see flying around the lights of the port if you're sitting enjoying the view of the lake. 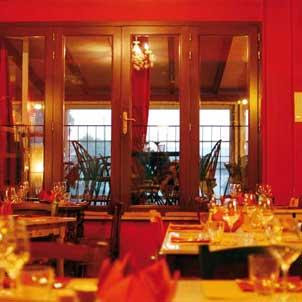 With the nice soft red lighting we can instead sit comfortably and check peruse the menu. Lake cooking, obviously, deftly and lightly performed. We can begin with the lake fishballs or with tench roe, and move on to (the menu does change with the seasons) spaghetti alla chitarra with smoked tench (and a variant, in which instead of spaghetti we find ravioli stuffed with the tiny beans of the Trasimeno), or the tagliatelle with perch sauce. Given the fairly abundant portions served it won't be easy to consume the classic "antipasto-first course-main course" tryptich, though we suggest those with robust constitutions try a modern version of tegamaccio, corregone (a white fish) fillets with greens, or more simply a nice selection of cheeses. Cholesterol aficionados can finish up with an apple tart or chocolate cake. When you order you will also be given the wine list. We suggest your glance be more than cursory, because it includes selections that are well pondered, with an emphasis on biodynamic wines. A few names, almost all sure-fire, a mix of Umbrian, Italian, and foreign that won't set your wallet back. When you're done the bill won't be more than 35 Euros per person, not including wine. An entirely acceptable charge for a "Red Right" dinner. San Miniato, a town on the left bank of the Arno River about 30 miles downstream of Florence, is not particularly known for its wine. Not that they don't grow grapes -- they do, and many farmers traditionally sold to nearby areas that are known for their wines -- but the wines they make never enjoyed much of a reputation. This of course made is extremely difficult for those who did try to support themselves through winemaking, and while Leonardo Beconcini's father Pietro did manage to install a few cement tanks in the cellar under their house, he wasn't able to line them with glass -- that improvement was made by Leonardo, when he took over operations in the early 90s. 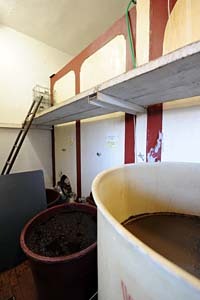 Since then Leonardo has added a number of new tanks, all but two cement (he bought a pair of steel tanks one year when he was unable to find used cement tanks), which he keeps outside and uses during the winter months, bottling the wines they contain or transferring them to the cellar when it gets too hot out. 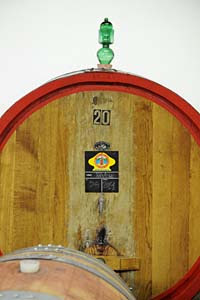 For that matter, Leonardo, whose only white is a Vinsanto, also makes do without computer-regulated refrigeration during fermentation: He keeps an eye on the temperatures in the vats, and if the fermenting wine gets too hot transfers it to a cooler tank outside, and then pumps it back over the cap. Temperature control is something he's like, but for now he makes do with what he has. 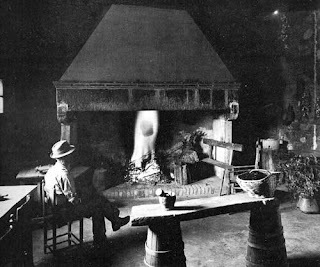 This frugality of necessity has also had a profound affect on the way he (and his father before him) managed their vineyards: Rather than periodically pull up the vines and replant them, as is generally done in Italy, Leonardo replaces the individual vines that die with cuttings from the best vines in the vineyard. 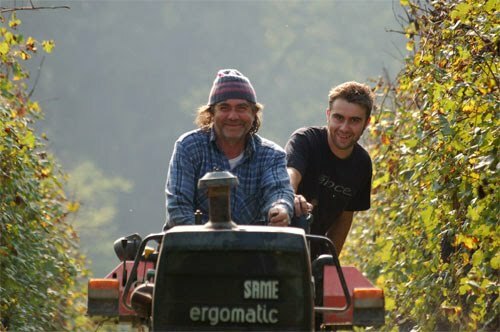 Doing it this way allows him, on the one hand, to not loose production (and income) for the 3-5 years it takes a newly planted vineyard to begin producing, and, on the other, maintains balance in the vineyard, as most of the vines at any given time are mature, and some as much as 80-90 years old. This way of vineyard management has also led to some unusual surprises. 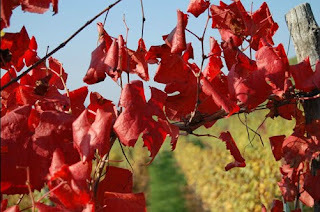 In particular, he had about 300 vines of a red varietal unlike any to be found in any of his neighbors' vineyards. It was quite particular, budding late and ripening early, and from an agronomic standpoint was actually better adapted to the region than Sangiovese, requiring less effort to cultivate as it was much more resistant to funguses and disease, and thus required fewer treatments -- something that is also important from an environmental standpoint. Moreover, it didn't want a tremendous amount of sun, but rather worked well in the lower parts of the hills. When he tried microvinifying the grapes from the mystery vine separately the resulting wine was good enough that he decided to use it to make a single-varietal wine of it, rather than add it to the blend as they had always done previously. To make a single-varietal wine one must say what the grape is (to the authorities, especially), and this is where he ran into problems -- while the experts who came to look ruled out the various lesser Tuscan indigenous varietals, for example Foglia Tonda or Pugnitello, nobody was willing to hazard a guess as to what it was. 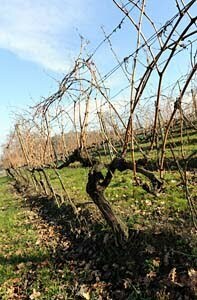 So Leonardo simply called it X, and continued studying it, propagating it through cuttings from the best vines. The answer finally came from Professor Attilio Scienza, who ran a DNA analysis on the mystery vine, and then called Leonardo to ask how it was that he had Tempranillo vines -- vines not exactly like the Tempranillo now grown in Spain, but clearly displaying the same DNA fingerprint -- in his vineyard. While Tempranillo is very common in Spain, this was its first known occurrence in Italy, and to have it turn up in a very old and very traditionally managed vineyard rather than an experimental vineyard belonging to someone bent on trying new things was puzzling indeed. The probable answer is a historical accident. San Miniato was one of the rest stops of the Via Francigena, the route pilgrims traveling overland followed to Rome from points to the north and to the west, and the land now belonging to Leonardo's family once belonged to the Bishopric of San Miniato, which was at one point one of the most important in Tuscany. Bishops of course had to manage their lands, and between 1730 and 1780 Leonardo's parish was home to Giovanbattista Landeschi, who was a cleric, but also a respected agronomist, and introduced many innovations; among other things he had the farmers terrace overly steep lands. Don Landeschi was also interested in viticulture, and wrote about making vineyard selections to improve wine quality -- he didn't go so far as to name the vines he was selecting, but it stands to reason that given his interest in vines a pilgrim might have brought him some, a travel souvenir from a trip to Spain, as it were, and that, when he saw that they were good, he propagated them in the vineyards he managed directly. As I said, Leonardo took advantage of the time he spent trying to identify "Vine X" to study it, and once he got it approved for cultivation used it to rationalize his vineyards. His land, as you can see from the photographs, gently slopes to the valley floor. In the traditional Tuscan manner it was planted primarily to Sangiovese, and he told me that the grapes (red and white) in the lower vineyards, where the soil is also quite clayey, with enough moisture that drought is never a problem -- further up slope there are also abundant of sea shells, scattered through the sediments and also in lenses -- almost never ripened completely, and also suffered from mildew and other problems to an extent that would make them unusable today. Enter Tempranillo, which buds late, making it less susceptible to the frosts that can strike valley bottoms in the spring, and ripens early too: The cooler temperatures of the valley bottom slow its ripening some, allowing it to develop greater complexity while ripening fully, while its resistance to disease and mildew allow it to stand up to the moisture. So Leonardo has planted the areas unsuited to Tuscan varietals to Tempranillo. 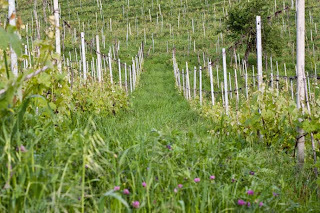 Sangiovese, Canaiolo and Malvasia Nera are in the central areas, and there are also two ridge crest plots planted to Sangiovese, for a total of about 12 hectares. Pietro named this after his two sons, Maurizio and Leonardo. It's their base wine, a 50-50 Sangiovese and Malvasia Nera IGT that was originally planned as a Chianti Superiore, though the grapes available made this impossible. 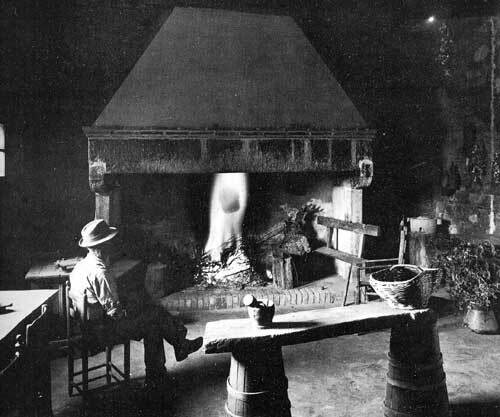 It is, instead, typical for San Miniato, and ages in 2, 3, 4, and 5-year old small oak. Deep cherry with black reflections and some almandine in the rim. The bouquet is fairly rich, with jammy cherry fruit laced with some wild berry fruit and slight graphite shavings hints iodine, and some spice. On the palate it's medium bodied, with bright cherry fruit supported by greenish vegetal accents and bright acidity shot with some licorice root, and by tannins that are fairly bright, and flow into a tart slightly vegetal finish. Pleasant in a fairly zesty key; there is lively acidity and the oak balances it without muzzling it, providing a smooth round underpinning. A wine that will work well with grilled meats -- spare ribs, for example -- or stews, and also with hearty meat based pasta dishes -- sugo alla Bolognese for example. These grapes are from old vines, and in the past Leonardo put them into Reciso, his Sangiovese in purezza. However, these vines are more productive, and he therefore siphoned them off into a new wine, allowing them to produce more. It's 85% Sangiovese, with a mix of Canaiolo and Malvasia Nera. They have always had some Canaiolo -- not a lot, but some, and he even has some Canaiolo rosa (which for now goes into his reds). It ages in large oak. Black cherry with black reflections and some almandine in the rim, which is brick. The bouquet is moderately rich, with cherry fruit laced with menthol and some brambly accents, and also some acidity to provide zest. Also hints wood smoke. On the palate it's medium bodied, with fairly bright cherry fruit supported by moderate acidity and tannins that are fairly smooth. Simple, and fairly direct, a food wine that will work well with what it's served with, not demanding attention, and go very fast. This was Leonardo's first wine, first vintage in 1995, and is from 6 small ridge-crest plots on two hilltops. Very steep slopes, and quite different exposures. 4 weeks maceration, more or less. -- it depends upon the quality of the skins. This vintage was aged in barriques and tonneaux (66/33, about 18 months); he now has added 10 hl botti to the mix. Deep black cherry with cherry rim. The bouquet is fairly intense, with cherry fruit supported by slight menthol, and some graphite shavings with spice and slight bramble, also some sweetness from alcohol -- it's 14.5% . Nice harmony, and the alcohol is not apparent as such. On the palate it's medium bodied, with full cherry fruit laced with nutmeg spice, and supported by minerality and savory notes, quite mineral, and by tannins that have a warm mineral burr and flow into a clean fairly long mineral finish. Quite pleasant in a rather austere key; it's far from a fruit bomb and as such more particular than some. If you like the style you will enjoy it considerably, but you have to like the style. Nice aging potential too. Their land is marine sediments, with quite a bit of salt, and also an abundance of fossil shells that release carbonates into the soil. Ixe (pronounced eexeh) is the Italian pronunciation of the letter X; this is Leonardo's lesser Tempranillo-based wine, made from the roughly 4.5 hectares of Tempranillo he planted between 1997 and 2005. It's about 4.5 ha in all. Here he allows the vines considerable liberty -- they're planted to 6,500 vines ha, and the production of the individual vines depends upon the number of buds. He green harvested through the 5th vintage, but once they reached equilibrium cut back, saying, "it's a very precocious varietal, and reducing the bunch load would lead to overly early ripening. 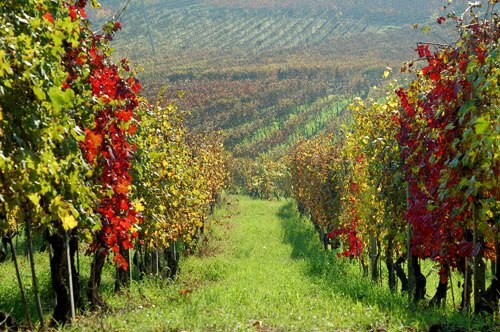 The goal is a simple wine; production is a bit less than 2 k per vine, 130 quintals per hectare. It ages in small oak, all old, and about 30% American oak, which Leonardo uses because American oak oxygenates more, and this counters Tempranillo's tendency to go into reduction. Deep black cherry, close to poured ink. The bouquet is bright, with sour cherry fruit laced with chopped tomato acidity, and savory notes, also some underbrush and bramble, and some wood smoke too, with underlying vegetal notes. On the palate it's medium bodied, with bright rather balsamic fruit -- it's quite distinct from Sangiovese -- supported by warmth and spice, and by tannins that are warm and balsamic and flow into a clean savory finish,. Also some mint on palate and nose. It's interesting, quite pleasant, and also quite obviously not Sangiovese, though just as obviously not one of the popular French varietals; if someone were to hand it to me and say "where's it from?" I might have guessed Calabria. Very fresh -- one wouldn't guess it's 14.5% alcohol -- and will work well with foods, especially grilled meats. This is from the historic vineyard, with the old vines that Leonardo started with, and a small parcel he planted on a ridge crest in 1998 -- a trial, which he is using for this wine. The grapes from the ridge crest are harvested early, and allowed to dry for 4 weeks prior to vinification. His aim is to make a Tempranillo with aging capacity, and to do this he needed ripe grapes. However, ripe grapes are low in acidity, so he harvests some earlier to have the acidity, and then works with the rest, allowing them to ripen. In the end it works it out. The wine is deep pigeon blood ruby with cherry rim. The bouquet is powerful, with rich cherry fruit laced with berry fruit jam, some menthol, slight underbrush, and some cumin seed. Interesting, and again clearly distinct from Sangiovese. On the palate it's full, and quite smooth, with elegant balsamic cherry plum fruit supported by savory accents and balsam-laced tannins with some cedar, and as the other elements fade lasting balsamic warmth. Interesting, and enjoyable, powerful and charged too, and because of its sweetness, which is in part alcohol -- 15.5 % -- it will work better with stews or succulent not too fatty roasts than grilled meats. It's reminiscent in some ways of an Amarone type wine, though the drying cycle is much faster. In terms of accompaniments, one might go with peposo, sweet-and-pungent hare (or boar), and other savory dishes with chocolate. Particular, and though it won't work everywhere it will be perfect in the proper setting. This is quite traditional, with some Malvasia Nera -- the percentage varies with the vintage, up to 30%. 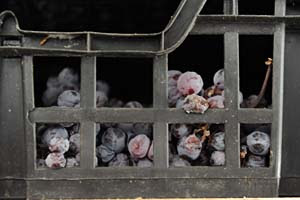 Leonardo generally dries the grapes until February, though this year (2011) it was dry enough that he pressed them at the end of December. 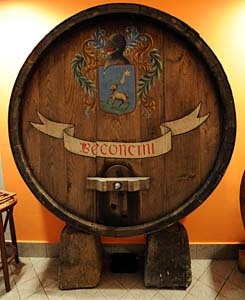 The wine ages at least 5 years in a mix of oak and chestnut casks. Leonardo has also begun making an Occhio di Pernice (Vinsanto from red grapes), but won't release it until 2014. This wine is tawny amber with greenish brown accents on the rim and some apricot reflections too. The bouquet is smoky, with considerable walnut skin and some nutmeats, and also quite a bit of sea salt and toasted almonds, and slight brown sugar. None of the oatmeal that sometimes emerges from Vinsanto. Slight dried fig, however. On the palate it's sweet, with the sweetness balanced by considerable savory notes, and by a tremendous wash of walnut supported by some savory accents, flowing into a walnut and toasted almond finish that lasts and lasts. Nuts in a glass, and quite pleasant, and as the nuts fade maple sugar sweetness emerges -- something I hadn't noted in a vinsanto before, but find quite nice. I was desperately trying to make some order among the wines I no longer have enough space for in my house, an operation I usually put off because I know that it probably won't be successful. Of course I have a wine cellar. Actually, a dedicated refrigerator, which can contain (give or take) 275 bottles. And the shelves I've set up on the ground floor and in my office on the second floor are also packed. Which leaves me with at least 12 cases that I have yet to place. In this mix of ever-more-disorderly bottles, my eye settled upon an almost-buried white: Langhe Solea 2001, from the Roagna - I Pagliari winery. I remember it was given to me -- together with some masterful Barbaresco and Barolo wines -- by the young Luca Roagna in 2006, when I paid them a visit with Pierluigi Gorgoni (of Spirito DiVino and more). I couldn't resist, I had to open it, especially because 5 years without refrigeration, even in the dark, carries risks. But we'll speak of the wine anon. I would rather discuss something I consider unexplainable and unjustifiable. The Roagna family has made wine in the hamlet of Paglieri, Commune of Barbaresco, for 5 generations. It is, thus, a historic winery, one that has always made amazing wines that make no concessions to fashion or trend (I remember a 78 Barbaresco that was simply extraordinary). Just to make myself clear, the Nebbiolo destined to Barolo La Rocca and La Pira Riserva macerates for 80-100 days on the skins, and considering how much extraction that will lead to one understands how long it must bottle age before one can open it and be bowled over by qualities few other renowned Italian wines can hope to even approach. But long macerations (with submerged cap) are part of a philosophy they apply to all of their wines, as is the use of selected indigenous yeasts for the fermentation (selection derived from careful research with expert microbiologists). 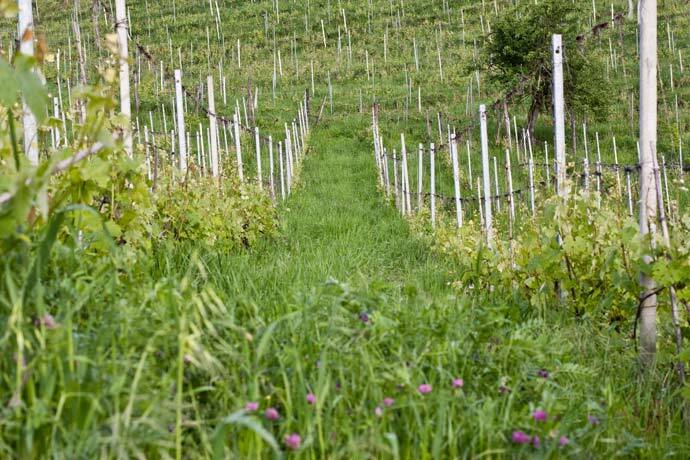 Biodiversity is another salient point: their land has vegetative cover, with mixed greens (Kyle's note: many vineyards in Langa have bare earth between the rows) that can include mint, spontaneous legumes, and all sorts of grasses and fragrant blossoms. Green harvesting is only carried out on vines younger than 20 years, allowing the vines to then find their natural equilibrium. There are ancient vines in the vineyards -- they were planted between 1937 and 1955), some on native rootstock, and with roots that can reach 30 feet into the ground; you can imagine how many microelements they can draw, and how resistant they are to drought. And when a vine dies it is replaced by one from a cutting in the same vineyard -- no clones, and indeed the Roagna family has banished that word from their viticultural vocabulary. All this to show that we're dealing with an extremely rigorous winery, one that really succeeded in combining farming traditions with modern technology, or perhaps it would be more correct to say, modern knowledge. The Roagna family doesn't like Guides, though this doesn't justify the Guides' ignoring them, considering that the wines of other top wineries that behave the same way are regularly reviewed. Paradoxically, they are better known (and liked) abroad. A meeting between Luca and Sigurd Wongraven, founder of the Norwegian Black metal group Satyricon, which came about thanks to reciprocal enomusical passions (Sigurd is also writing a book on Piemontese winemakers), has led to two wines, one from a few casks of Barolo Pira and the other from a few casks belonging to friends of the Roagna family, casks personally selected by Sigurd: Unione Wongraven Barolo and Alleanza Wongraven Langhe Rosso. Setting aside the Guides for the moment, though there are certainly many wine lovers who know the winery, it is rarely mentioned on the web and a search turns up few reviews. Between 2010 and 2011 I have however discussed, on Lavinium, Barbaresco Crichët Pajé 1998, Pajé Riserva 1997 e Barolo La Rocca e la Pira Riserva 1993. This time we will speak of Langhe Solea 2001, from Chardonnay and Nebbiolo vinified white, because I believe Langa is not just a land of great reds, but can also be a land of whites, capable of long aging. I don't recall the exact percentage of Nebbiolo in this vintage, though it is on average about 25. Yields per hectare 35-40 hectoliters! Macerations on the skins for 10-15 days, with Nebbiolo added after pressing. The wine ages for 3-5 years in large French oak casks, and then in bottle. And here it is, poor thing, not kept as I should have, but even more praiseworthy for having survived 5 years in my house. The color is what one would expect of a white that spent a long time macerating, a truly enticing intense warm gold. The nose puts my worries to rest, it's in perfect condition, and balanced, with barely ripe tropical fruit, floral accents and mineral notes, peaches, mangos, lychees, walnuts, candied pineapple, moss, orange and acacia honey, hints of limestone and finally aromatic herbs. On the palate it's pure silk, far beyond what I expected, and astonishingly fresh! Lively in every way, savory and deep, extremely persistent, elegant, refined even, and in perfect harmony with that promised by the nose. I confess to being astonished, because I tasted the wine 5 years ago in the cellars and only partially recognized its greatness. It's impressive to note how the more than a decade since the harvest hasn't weighed upon the wine in the slightest; it still has a long future ahead of it, on a par with that of a Langan red. These are the Roagna! Make plans to visit them, because when you do you will never forget the day. Antiche Cantine de Quarto is another winery I tasted the afternoon I left Vinitaly for Vin Nature, a group of winemakers who eschew all kinds of chemicals and pesticides -- I sat down for what I thought would be a last wine before dinner, liked it, and tried another and another. Rather like nibbling on a bowl of cherries. This is a Minutolo; it's elegant brilliant brassy gold with brassy reflections and has an intense bouquet with considerable goodeberry laced with roses and greenish vegetal accents, supported by acidity that has a definite mineral zing to it. A lot going on. On the palate it's full and rich, with powerful lemony fruit laced with some citrus, and deft greenish minerality that flows into a bright gooseberry citrus finish. Quite zesty, and will work very well with flavorful grilled fish and dishes such as a Tiella. Something to keep an eye out for. Deep cherry ruby with almandine rim. The bouquet is rich, with jammy cherry fruit supported by some concord grape jelly and considerable sweetness. Voluptuous. On the palate it's full and rich, with powerful cherry plum fruit supported by plum sweetness and moderate acidity, while the tannins are smooth and fairly dry, and flow into a clean fresh prune finish. Very nicely balanced, and though it is fairly strong the alcohol doesn't disturb. A fine, fine expression of the varietal, and worth seeking out. This is made from the best bunches, ripened further, fermented slowly, and then aged in wood for a few months. Inky purple. The bouquet is rich, with jammy Concord grapes laced with sweetness and some petroleum, hints of gooseberry, and deft spice with underlying alcohol. Beautiful balance and complexity though I found myself preferring the linearity of the Mucchio. On the palate it's full and smooth, with rich red cherry plum fruit supported by deft berry fruit acidity and warmth that has savory balsamic accents, and by tannins that are dry and cedar laced, and flow into a long warm cedar laced finish. Very fine and quite approachable, and if you are of international tastes you may prefer it, but I find that Primitivo really doesn't need wood. Deep cherry ruby with some almandine in the rim. The bouquet is fairly intense, with red berry fruit supported by lively acidity and some vegetal accents; it's fairly rich, and gives an impression of zestiness. On the palate it's medium bodied, with bright sour cherry fruit laced with minerality and some underbrush that flows into a clean rather fresh mineral finish. Pleasant, and will drink well with red meats or light stews. Again, Negroamaro. Deep pigeon blood ruby with almandine rim. The bouquet is fairly intense, with berry fruit laced with green leather and savory notes, as well as sweet underbrush and minerality. Nice depth in a mature key, and as it opens herbal accents also emerge. On the palate it's fairly full, with bright berry fruit supported by some sweetness from alcohol, minerality, and tannins that have a warm peppery burr and flow into a clean brambly greenish finish. It's a nice expression of the grape, and will work well with grilled meats or hearty stews, though I wouldn't age it for that much longer. Deep pigeon blood ruby with cherry rim. The bouquet is rich, with brown sugar and hints of leather mingled with caramel and plums, prune fruit and some vegetal accents, lacy sugar, violets and other blossoms, mentholated notes, and one could go on and on. Terrific complexity. On the palate it's full, rich, and sweet, with elegant prune cherry fruit supported by warmth and sweet tannins, and is beautifully harmonious, a wine that seems simple because everything is in its place, but that one can sip for hours without tiring of. They also make a liqueur called Elisir di Primitivo, a digestivo of sorts, which was a very nice way to finish up the tasting. Extremely pleasant. Deep almandine with black reflections and almandine rim with hints of brown. The bouquet is intense, with mentholated brandied cherries laced with prunes and balsamic accents, savory notes, and leaf tobacco. Mature and fairly elegant. On the palate it's full, with rich brandied cherries laced with prunes, leaf tobacco, and savory balsamic accents that echo the nose (and carry into the finish) and is supported by silky tannins that flow into a clean finish with some underbrush as well as the fore-mentioned balsamic accents. It's graceful, in a rich rather opulent key, and I found it unexpectedly good. A bit too powerful for arista, but good. The vintage certainly helped -- 2001 was very good -- but it showed much better than I expected it to, and it is perhaps time to contact the Tenuta for a Brunello vertical; if could vintages of the Brunello also follow this path they may prove quite interesting. Day before yesterday Giulio Gambelli, an extraordinarily humble man whose knowledge of Sangiovese was second to none, and who had a hand in many of the great Tuscan Sangiovese-based wines, left us to discuss wines with the Creator, whose great gain is our great loss. I didn't know him well, because though our paths did occasionally cross, I was too shy to say much, and he too hard of hearing to understand what little I did say. I expect he thought me a bit slow, but was much too polite to say so. I do have one story however: a number of years ago I was at a restaurant with a couple of friends, one a winemaker and another an importer. We started with a Morellino di Scansano of the sort I like, one that remembers "ino" is a diminutive, and is light, sassy, and deft on its feet, and then tried a wine the Gambero/Slowfood people raved about, awarding the first vintage to appear in the Guida the coveted (especially then) 3 glasses. We were swishing, muttering about nice concentration, admiring the color, discussing balance, and taking tiny sips, until the Importer said, "The hell with this. I want to drink!" and ordered a bottle of Pergole Torte, one of Giulio's creations. When we left the Pergole was gone, while the other bottle was still more than half full. Returning to the topic at hand, there's no getting around it, times are tough and people are cutting back. And this is perhaps one of the reasons that Vallardi has reprinted Lunella de Seta's La Cucina al Tempo di Guerra, a book that came out in 1942 to help Italian housewives do their part for the War Effort, by "winning the daily battle to feed their families." It makes for interesting reading. Because there was rationing, and it bit deep. But before helping people to figure out how to cook without many of the ingredients they were accustomed to, she thought it best to stress that even in times of want one must carry on -- the table set as always, but using a brightly colored tablecloth that won't show stains (with soap rationing daily laundry wasn't an option), use pots and baking tins that can also double as serving dishes to reduce the number of pots to wash, and so on. And then there are the recipes, and here one naturally wonders what -- given rationing -- is missing. Meats and fats especially, as well as white flour (when calling for flour she generally specifies segale, rye), and also whole milk, which she does call for, but also says how to substitute for more than once. Coffee too; it had vanished completely from all but the most fortunate tables, and she says not just how to make coffee from orzo, toasted barely, but also from toasted ground acorns (there is also a pudding with acorn flour). And what is present? Meat extract and bouillon, which are used extensively to perk up soups, canned meats -- about half the recipes in the meats section are for canned meat prepared one way or another, while many of the rest are for barnyard animals, rabbit especially -- and legumes, vegetables, greens, and fruit. The vegetable kingdom is as one might expect very important; in introducing salads she says that given the situation, one can enjoy nutritious meals without being a slave to tradition, and simply have a soup or other first course followed by a salad -- something that seems natural now but that was a big break with tradition then. Equally important are legumes, which she notes have less fat than meats, but ounce for ounce have as much or more of the other nutritional needs, i.e. protein, carbohydrates, and calories -- and greens, which she says are much healthier than meats, providing the "body with what it needs to counter losses of energy and keep itself in perfect shape," whereas meat proteins "slowly intoxicate, to a greater or lesser degree depending upon one's constitution." Again, ideas that are widely accepted now but that were revolutionary then. Taken as a whole it is a fascinating book, and though I might not feel the need to use meat extract (and likely not canned meat either) many of the book's 346 recipes are still current, and the sorts of things that are nice to fall back upon in the new age of frugality we seem to be entering. A refined, and particularly nutritious dish. Wash spinach very well as usual, boil it, squeeze it dry, chop it very finely, and put it through a wire mesh strainer to make an airy cream. In the meantime, prepare in a pot a béchamel sauce of sorts, with a tablespoon of butter, a tablespoon of rye flour, and the proportionate volume of milk, salting to taste and bringing the mixture to a boil. Mix the spinach well into the pot, and add another cup of milk to dilute the mixture. In the meantime, line the bottom of your soup tureen with croutons. If you lack milk, or want to be more frugal, rather than add milk to the butter-and-flour mixture at the outset you could use water, adding, when the dish is heated through, a cup of whole milk and a tablespoon of unsweetened condensed milk.